The Super Mario Bros. anime (Super Mario Bros.: Pīchi-hime Kyushutsu Dai Sakusen!) from 1986 will really mess with your mind if you’re a fan of the massively popular Nintendo franchise. This rare film was directed by Masami Hata of Little Nemo: Adventures in Slumberland fame, and written by Hideo Takayashiki. Super Mario Bros.: Pīchi-hime Kyushutsu Dai Sakusen! 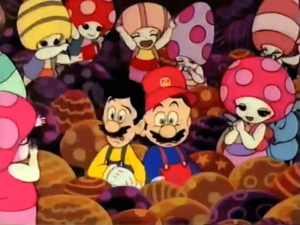 was released as a limited run in theatres as a promotional tie-in with the Japanese version of Super Mario Bros. 2, and presumably because Nintendo hadn’t at that point laid out proper guidelines for depicting their characters in other media, this is a strange film. That being said, it is a fun watch that is mostly true to the Super Mario Bros. universe, just with a lot of moments that will really mess with the well-established Mario canon. If you’re not convinced that you need to watch this movie, here’s a list that might convince you to give it a shot. Let’s start with the elephant in the room – Luigi’s shirt is yellow in this movie and his hat is blue. It’s like an imposter has substituted himself for your best friend, and they act just like your friend, but you know something is off. It seems like a kind of unholy troll on behalf of the filmmakers, since even the sprite of Luigi in Super Mario Bros. wore green. Most likely it was done to improve contrast between the two characters. 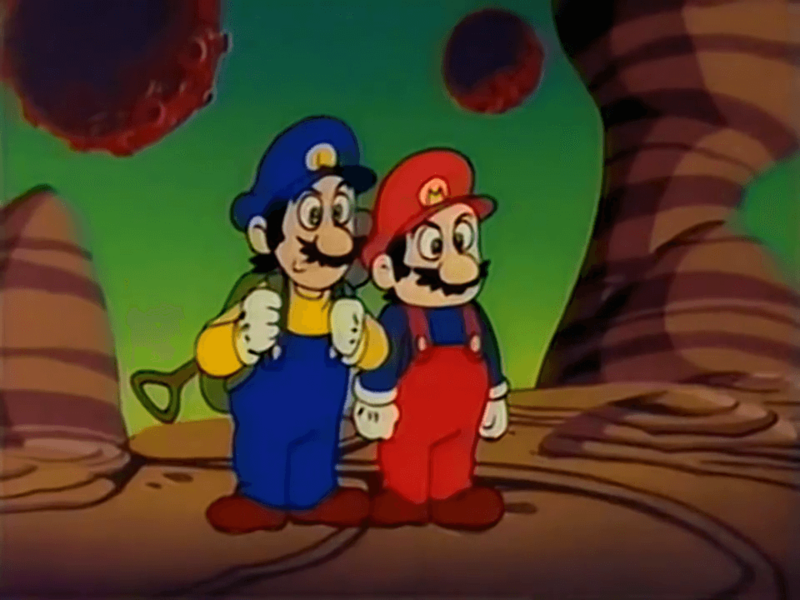 However, this film was also the first depiction of Luigi being taller than Mario, and the first time Luigi is seen as goofier and more cowardly than Mario. 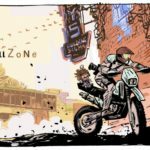 This one is strange to take in, but the Mario Bros. development teams may have taken inspiration for game mechanics from this film over the years. 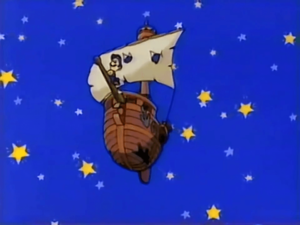 This film introduced the concept of an airship (Super Mario Bros. 3), Mario being able to ride on Lakitu’s cloud (Super Mario World), and even Mario’s technique for beating Bowser by spinning him by the tail (Super Mario 64). 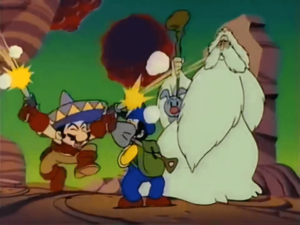 Super Mario Odyssey may have even taken a cue from the film, as you get the first ever instance of Mexican Mario. 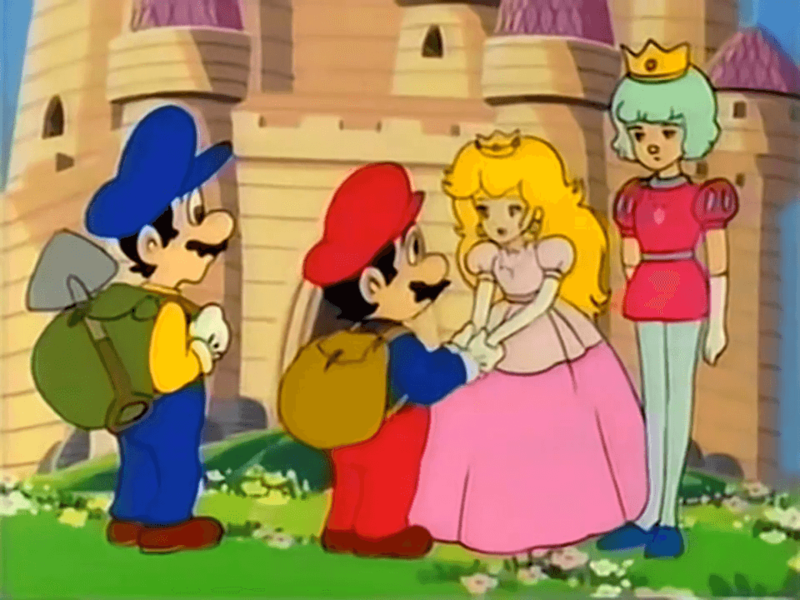 This film is also the first depiction of Bowser being infatuated with Peach and wanting to marry her, and boy-oh-boy, he switches between fawning over her and lording over her at the drop of a hat. 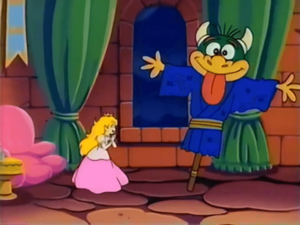 In one of the film’s more bizarre scenes, Peach attempts to trick Bowser by asking him to “change into something amusing” for her. 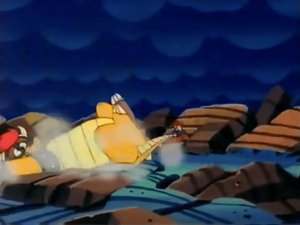 Despite being busy for the wedding, Bowser caves and agrees. Her last request is to get him to become a teddy bear that she locks in a box, but the two before that are… interesting. 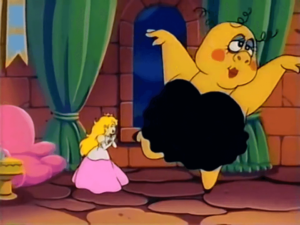 First she asks Bowser to become a “Pokero,” which is some sort of scarecrow creature, and then a “Buchimonta,” a feminine creature in a dress. 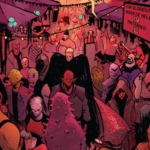 There aren’t really words to describe this scene, so I’ll just let you take in these images. 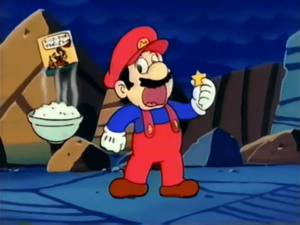 Religion is the last thing you’d expect to find in the Mario franchise, but there’s a line in the song “Mario the Great: Dancing with Mario” from the movie’s soundtrack that definitely stands out for its odd placement. 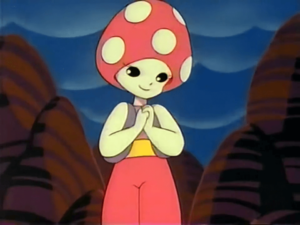 It wouldn’t be a Mario movie without some Toads, but their depiction in this film is so, so frightening. Just… look at their eyes. Even Mario and Luigi look terrified. What do you do when you need to convince a clam to open up? Not this – but in this universe, it’s what Mario thought was best. He convinces his wigger-dog hybrid companion (more on this in #8) to rock out with a David Bowie star over his eye and stubble that comes out of nowhere, while Mario traipses in as a ballerina to steal the star inside the clam. Mario? A corporate shill? Say it isn’t so! 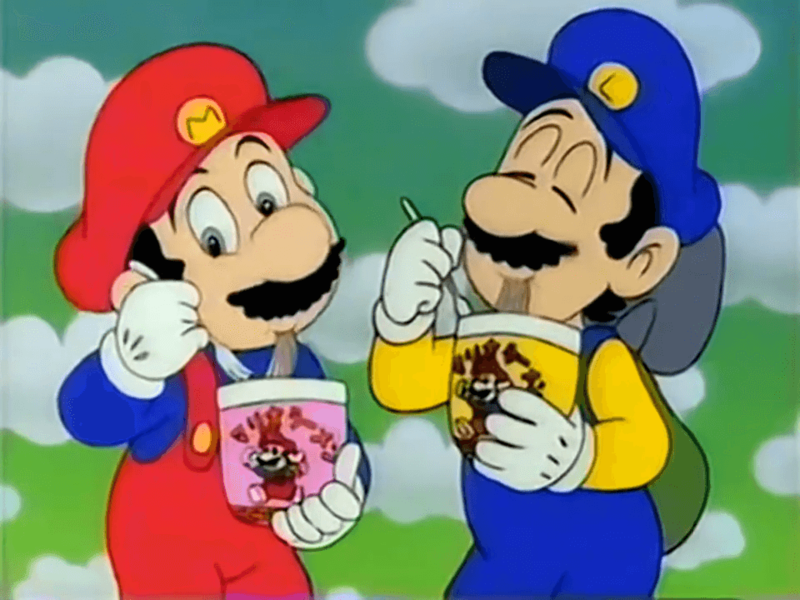 At two points in this film, “Mario Ramen” and “Mario Sprinkles” literally appear out of nowhere with no real context. Apparently, these were real products that were available in Japan to promote the upcoming Super Mario Bros. 2. The worst part? 31 years later I want these products, but I don’t have a time machine! Well played, Nintendo. Last but not least, this freaking guy. We’re used to Mario not getting any love from Peach, but this is the ultimate insult. After saving the day, it looks like Mario might get some – but then, their wiggler-dog companion friend transforms into a prince, who says he’s from the Flower Kingdom, and his name is… Hal? Conveniently, he has the necklace that shows that he and Peach are destined for one another. Suffice it to say, Hal has never received a nod in any subsequent Mario game or media. He’s about as bland as they come. However, the whole scenario is strikingly reminiscent of Howl’s Moving Castle when the scarecrow turns out to be the missing prince. Coincidence? Probably. Don’t worry, Mario. You’ll get some real recognition from Peach someday. Are you fan of the Super Mario Bros. Anime or any other video game cartoons from your childhood? Be sure to let us know in the comments! 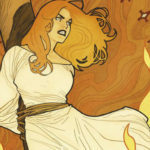 Next post: Wonder Woman 2: A “Great Love Story”?